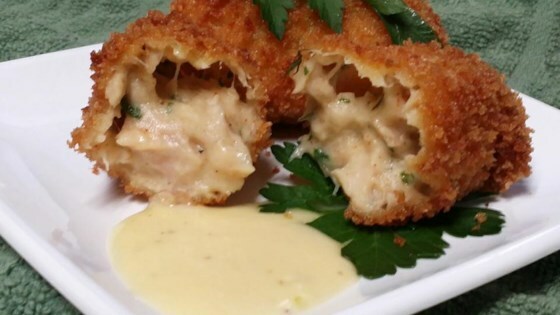 "Tuna, panko, and fresh herbs are used to create delicious Spanish tapas-inspired bite-size croquettes with garlic aioli for dipping. Garnish with sprigs of parsley." Whisk egg yolk, garlic, and 1 tablespoon lemon juice in a bowl until well-blended. Drizzle in 1 tablespoon olive oil and canola oil slowly, whisking constantly, until blended. Drizzle in remaining olive oil and canola oil, whisking constantly, until thick and smooth. Season with salt, pepper, and paprika. Transfer aioli to the refrigerator. Melt butter in a skillet over medium-low heat. Stir in flour to make a paste, about 1 minute. Reduce heat to low. Stir in milk gradually until sauce thickens, 2 to 3 minutes. Stir in tuna, parsley, chives, dill, 1/2 teaspoon lemon juice, lemon zest, and nutmeg. Cook and stir until mixture is the consistency of mashed potatoes, about 3 minutes. Season with salt and pepper. Spread tuna mixture in a baking dish. Cover with plastic wrap and cool in refrigerator, 2 to 3 hours or overnight. Whisk 2 eggs in a small bowl. Divide chilled tuna mixture into 8 equal portions; shape into cylinders or patties with lightly moistened hands. Dip cylinders into egg wash and roll in bread crumbs to coat. Arrange on a plate and chill until firm, about 1 hour. Fry croquettes in batches until golden brown, 5 to 8 minutes. Remove with a slotted spoon and drain on paper towels. Serve alongside aioli. Watch Chef John make the crispiest onion rings ever! Substitute regular bread crumbs for the panko bread crumbs if desired. Substitute safflower oil for the canola oil if desired. The aioli contains raw egg. We recommend that pregnant women, young children, the elderly, and the infirm do not consume raw egg. Learn more about egg safety from our article, Making Your Eggs Safe.